Dhaka, Aug 25 (Just News): BNP Chairperson Begum Khaleda Zia has called upon the countrymen to stay alert and remain united to continue the ongoing movement for restoration of the country’s democracy, party’s Secretary General Mirza Fakhrul Islam Alamgir said today. “Madam is quite ill but morally strong now. 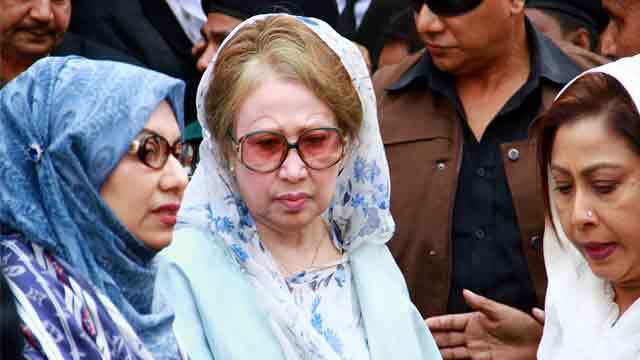 She asked us to stay alert and remain united to continue our movement for restoration of the country’s democracy,” Alamgir told reporters after meeting her at the Old Central Jail in Dhaka this afternoon. Alamgir met the party chairperson at the jail on Nazimuddin Road in Dhaka around 4:05pm and shared the party’s present stance in ensuring her immediate release from the captivity. The former prime minister is now serving a five-year rigorous imprisonment following a Dhaka court’s verdict on February 8 in the Zia Orphanage Trust case. The former prime minister sought blessings from the countrymen to overcome the situation, the BNP leader said.